LOCATION.--Lat 39°56'29", long 74°05'02" referenced to North American Datum of 1983, Dover Town, Ocean County, NJ, Hydrologic Unit 02040301, on Route 37 bridge, 3000 ft west of Seaside Heights, 1.2 mi northeast of Goodluck Point, and 1.4 mi east of Bay Shore. Prior to this, the gage was located under the bridge tenders office, on the east bound portion of route 37. PERIOD OF RECORD.--Continuous-record tide gage, April 2000 to current year. 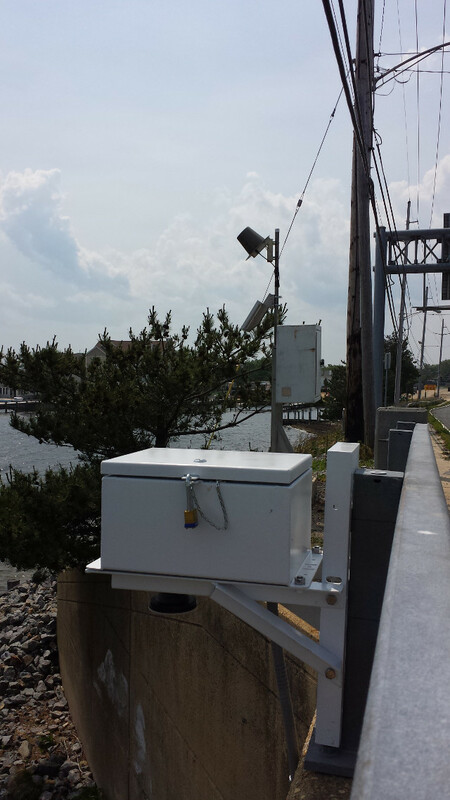 Prior to June 12, 2015, gage was located 0.2 mi southeast of the the Route 37 bridge and was published as 01408750 Barnegat Bay at Seaside Heights. GAGE.--Tide elevation recorder with telemetry and tidal crest-stage gage. Datum of gage is at 0.00 ft NAVD of 1988. To determine approximate elevations to NGVD of 1929 datum, add 1.01 ft. REMARKS.--Records poor. Streamflow at this site is significantly affected by astronomical tides. Daily mean discharges were computed from filtered unit value discharge data. The Godin low-pass filter is used to remove principal tidal frequencies from unit values. Positive discharge (ebb tide) is generally to the south direction, and negative discharge (flood tide) is generally to the north. EXTREMES FOR PERIOD OF RECORD.--DISCHARGE: Maximum positive discharge (unfiltered), 74,800 ft3/s, Oct 30, 2012; maximum negative discharge (unfiltered), -182,000 ft3/s, Oct 29, 2012. GAGE HEIGHT: Maximum gage height, 6.35 ft, Oct 30, 2012; minimum gage height, -1.97 ft, Feb 19, 2013.